Join us for a fun and educational out of school time event! 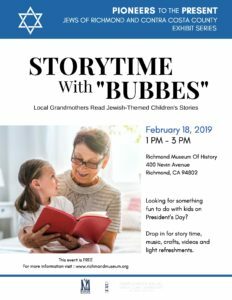 From 1-3 PM on February 18, 2019 (President’s Day) a group of nice Jewish grannys will be reading stories for kids of all ages. What is a Bubbe? Bubbe means Grandma in Yiddish! The Bubbes will read stories celebrating Judaism and multi faith. A Bubbe will be available to read in Spanish. The program is part of the Pioneers to the Present: Jews of Richmond & Contra Costa County exhibit series that runs through June 30, 2019.